RYAN: I’m almost too giddy to even talk about Les Misérables. Most anticipated movie of the year is an understatement. CAROLINE: I have been absolutely dying to see this too. As collective musical theater geeks, there couldn’t be a movie more tailor made for us, LBH. RYAN: We both loved the show on Broadway, and there’s always some trepidation when they cast A-list Hollywood actors in a film adaptation. But it worked in this case. Just hold off your Russell Crowe for a moment. CAROLINE: I’m going to have to bite my tongue, but you’re right; we should start with the positive. Hugh Jackman said in an interview that this was the role he was born to play and I think he’s right. RYAN: He’s so freaking amazing and this role really let him showcase all of his brilliant talents. I love him so much and think he deserves the Oscar for this role. CAROLINE: It’s a tough year in the Best Actor race, but Hugh would be at the top of my list too. His singing prowess as well as his physique come into play big-time in this movie and he’s one of the only movie stars who could pull this off. 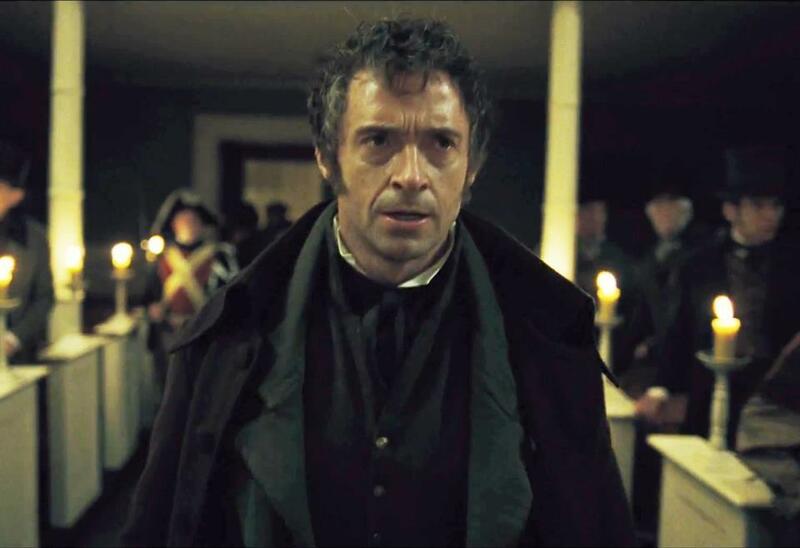 I am in awe of how deeply he got into the character of Jean Valjean. His face looked like it had been ravaged. 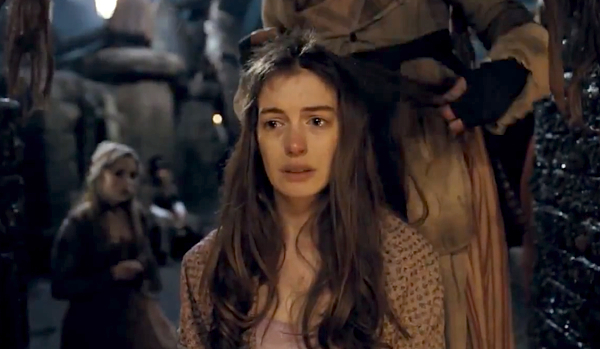 RYAN: Working equally hard was one Anne Hathaway, who’s gotten a lot of great press for her turn as Fantine, and deservedly so. I’ve been a fan of hers and her singing for years, and now the rest of the world is finally catching up. CAROLINE: She isn’t my favorite, but she really gave it her all in this role. She only has a few scenes, but she really nailed them. My only beef was how she could be so stunningly gorge with long flowing locks of hair when everyone else looked like hell. RYAN: I think that was a stylistic choice to heighten the drama, and it really punctuates her decline. Her rendition of “I Dreamed a Dream” was so genius that I’m calling it now; she earned the Oscar. Not only is she competing against every other actress in her category this year, but she’s also compared to some of the world’s best singers who’ve sung that song before here – hello, Patti Lupone – and she still made it her own. CAROLINE: There is some serious well-done acting in this movie. I think my third favorite after Hugh and Anne was Eddie Redmayne. What an awesome surprise he was! RYAN: Who knew he could sing like that? And he looked cute too. CAROLINE: He’s odd-looking but so great in the role of Marius. 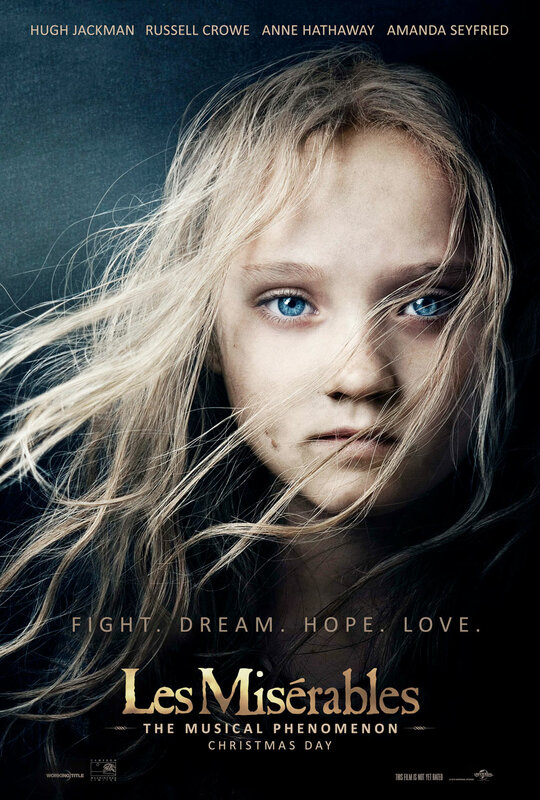 Amanda Seyfried is Cosette, and while she can sing, she doesn’t really hold a candle to the others. But her pretty face is perfect for the role. RYAN: Amanda’s vibrato annoyed me. And while I loved her in Mamma Mia!, I don’t think she worked as well in this movie. 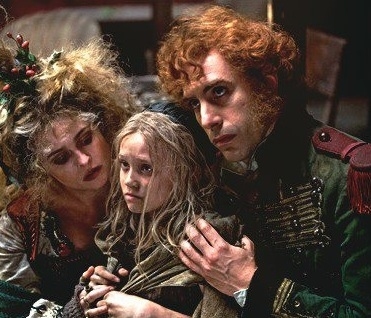 Then again, I’ve never been a big fan of the adult Cosette in the show. It’s kind of a boring role. CAROLINE: I was little bummed that they cut out whole sections of songs, like in “On My Own,” though I understand they probably had to for timing reasons. RYAN: Oh my God, I didn’t even notice that till you said it!! Maybe that’s why that number wasn’t as much of a showstopper as it is in the stage version. That’s my favorite song in the show but it wasn’t my fave in the movie. CAROLINE: The actress who plays Eponine is kind of the only adult main character who isn’t a big star, so maybe that had something to do with it. 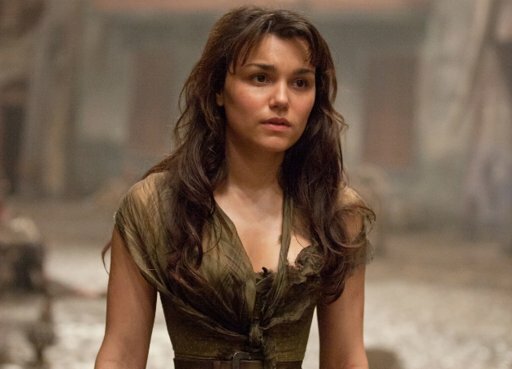 RYAN: Her name is Samantha Barks and she has played Eponine on the West End in London. I think she held back for the movie. She didn’t belt it out like she does in the stage version, which you can youtube, and I wish she had. CAROLINE: Can I finally talk about how disappointing Russell Crowe was? CAROLINE: He sucked the life out of every scene he was in. I will never understand this casting. He’s an imposing figure, which is good for the role; but his singing was so flat and so without any depth or passion that it truly saddened me. It was like Renee Zellweger in Chicago. RYAN: Yeah. When you see Les Miz on stage with a Javert who is competent, you leave feeling the weight of the role. 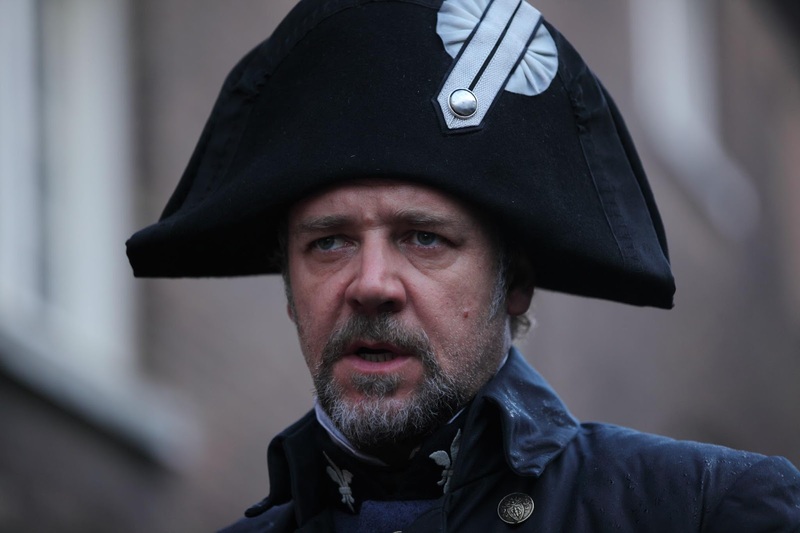 But Russell made Javert feel like such a minor character, when he’s supposed to be huge. He’s definitely the weak link in the film. CAROLINE: It would have been great to have a real foil for Valjean, but Russell’s weakness just made Hugh shine all the more. I will totally see this movie again in the theater. RYAN: There’s a new original song in the film called “Suddenly,” written so that they could have a song in Oscar contention, and I liked it a lot. CAROLINE: Another noteworthy thing about the movie is the sets, costumes and makeup. Wowza. Everything feels very epic, and sometimes it’s a little much. But the overall effect is very good. RYAN: The design is truly beautiful. The stage show consists basically of one big brigade set that moves around, so seeing this in such a realistic way was really thrilling. Nominations are deserved across the board. CAROLINE: It’s definitely an event movie and the fact that it’s coming out on Christmas Day, makes it all the more so. I have several friends who are going to see it on or around Christmas. I’m so glad the buzz is good, because we always love it when a movie musical is successful. RYAN: I loved Sacha Baron Cohen and Helena Bonham Carter. They were perfectly suited for these roles, except we’ve seen HBC with that hair in too many roles by now. She needs to rock some normal looking hair in a movie again. CAROLINE: You know I love me some Sacha, but I wasn’t sure how I felt about these two. They are the comic relief of the film and sometimes they were a little over the top. I also didn’t get why Sacha BC had a French accent when everyone else was doing British. But it’s always good to see him in a movie, and they were fun enough. RYAN: It’s always a challenge to adapt a Broadway show to a movie, and there’s all the more pressure on it when it’s a hit Broadway show. Since this is one of the biggest shows ever, expectations couldn’t have been higher and happily, it delighted me on every level. I’ve already seen it five times. CAROLINE: Wowzer. Like I said, I will gladly see it again, and it’s definitely one for the big screen. It’s long at two and a half hours., but that didn’t really bother me since it’s so epic. I can’t get over how phenomenal Hugh Jackman was. “Bring Him Home” was a highlight for me. Clearly, if you are familiar with the musical, you’re going to enjoy this movie all the more. Other than my devastation about the Russell Crowe casting, I can’t recommend this movie enough. So perfect for the holidays. RYAN: It’s the best picture of the year.